Set against the turbulent political times and the collision of East and West in 1930's China, this autobiography describes the complexities of Adeline Yen Mah's relationships with her stepmother and siblings, and the trauma of her parents' deaths. - Publisher When Adeline Yen Mah's mother died giving birth to her, the family considered Adeline bad luck and she was made to feel unwanted all her life. 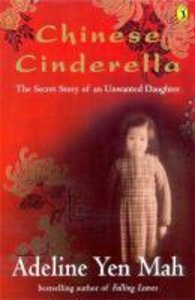 Chinese Cinderella is the true story of her struggle for acceptance and her triumph against almost overwhelming odds. When Adeline Yen Mah's mother died giving birth to her, the family considered Adeline bad luck and she was made to feel unwanted all her life. Chinese Cinderella is the true story of her struggle for acceptance and her triumph against almost overwhelming odds. Although Adeline Yen Mah was born into a wealthy family in Tianjin, China in 1937, her childhood was an unhappy one. Born female in a culture that often devalues women, her situation was made worse by the fact that her family blamed Yen Mah for her mother's death, which occurred just after she was born. Her autobiography, Falling Leaves: The True Story of an Unwanted Chinese Daughter, details the emotional abuse she suffered from her father, siblings and, in particular, her stepmother. Most notable was the fact that her family, fleeing to Hong Kong in 1948 as the Communist army gained control of China, initially left the 10-year-old Yen Mah behind, in a boarding school in northern China. An international play-writing competition made it possible for Yen Mah to escape her unhappy family life when she was 14. She won the competition, and this convinced her father to send her to a boarding school in England. Yen Mah remained in England for 11 years, attending college and earning a medical degree. When she returned to Hong Kong in 1963 to do an internship, however, Yen Mah found that her family's attitude toward her had not improved. She left again, this time to accept a residency in the United States. In the U.S., Yen Mah found professional success, eventually becoming the chief of anesthesiology at Anaheim Community Hospital in California. She also found personal happiness with her second husband, Bob Mah, and their two children. However, she was always troubled by her estrangement from her father and stepmother, and after their deaths she went through a period of severe depression. She began writing Falling Leaves as a way to work through her feelings of rejection, never imagining that her story would become an international bestseller.